Mr G Online | iPads, web tools, 21st Century learning, Maths Ed and all other things educational I'll think of! In the days when great edtech was a child printing out a Word document to give to the teacher or a teacher presenting a lesson to the class via a garish PowerPoint slideshow complete with lasertext transitions(!?! ), the last thing on anyone’s mind was who owned that picture I downloaded from Google. 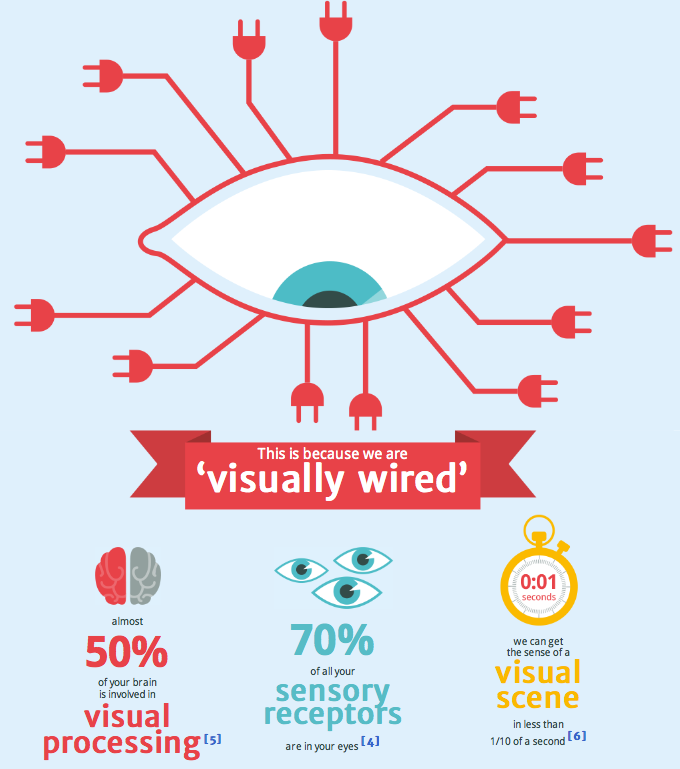 To be honest, I would think the vast majority of users still think every image on the “Interwebs” is up for grabs, along with all those movies and songs we’ve been ‘innocently’ downloading over the years. Now, however with the advent of Web 2.0 online publishing as a norm in schools, protocols and expectations have to change. A picture on a printed Word document is one thing – it is hidden from public view and the owner of the image is none the wiser. Technically still not abiding by copyright possibly ( I’m not a lawyer ) but highly unlikely you will be chased down for the crime. 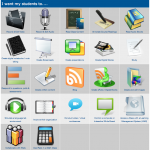 Publish it on your blog, glog, vlog, podcast, Prezi, iBook, Screencast, etc? You better be following the right protocols. If we are going to open the world of published authorship to our students, it is our responsibility to educate them in appropriate use. 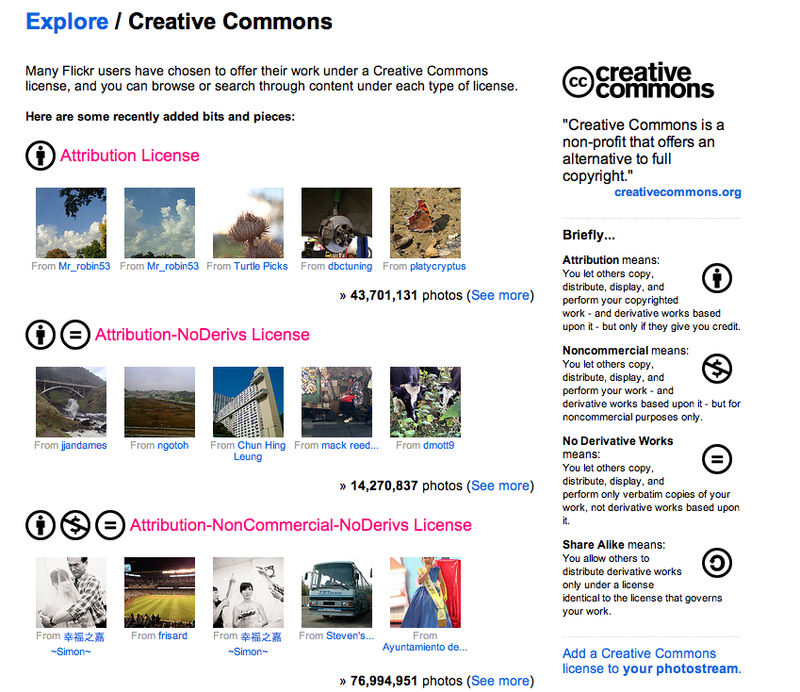 Enter Creative Commons – and the fine folk from foter.com who have created this infographic to explain how its done. 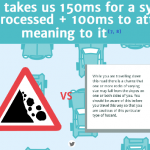 Not only does it explain clearly through a visual representation what CC is, what it means to you as a user and possible publisher, and what each attribution category means, it also shows how to correctly attribute images you use. In encouraging our students to publish to a real online audience, not only should we be teaching them to attribute the work of others they use in their content, we should also be teaching them how to apply licences to their own original work so that their intellectual property is also protected. Once you have scrolled through this lengthy but easy to follow guide, also take time to browse through additional screenshots and resources I have put together to highlight how online heavyweights Google Search, YouTube, Flickr and Creative Commons themselves make it easier for you to find free to use content. (Check out foter.com too – they have an extensive library for you to use.) 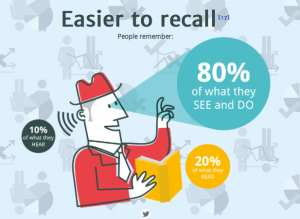 And remember – if its not sure, make sure your audience knows it not yours. Give credit where credit’s due and you will never be short on content to use in your online work. 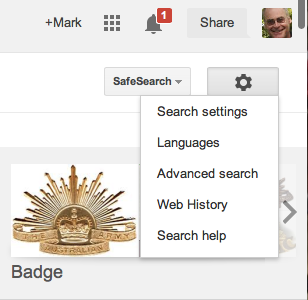 Not sure why it is hidden away in hard to find places but once you find Google’s CC search option in Advanced search ( in the little cog icon as shown below) you will have little problem finding CC attributed images to use online. 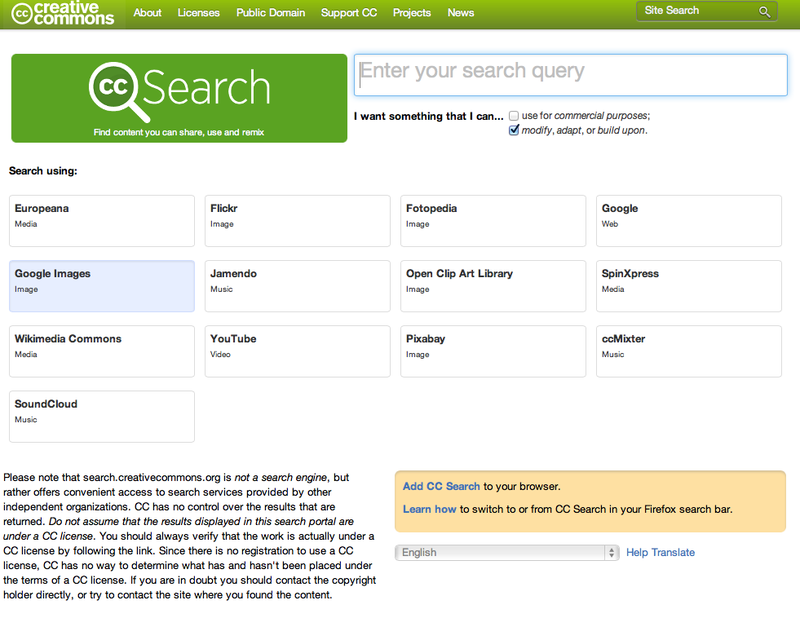 Creative Commons itself as a Search feature itself that allows you to access multiple sites for online content including images, audio and video. Importantly, they also have a timely disclaimer/reminder making it clear you still need to check if the image is CC licensed. We need to instil this habit in our students and teachers. Two recent additions to Youtube make it easier to use CC licensed video and audio in our multimedia productions. 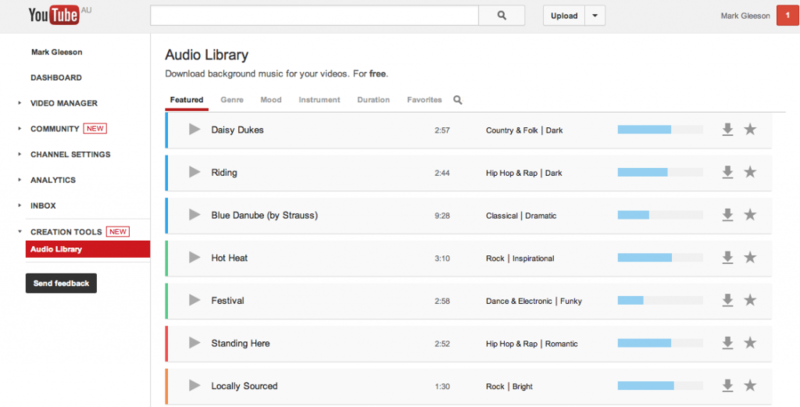 YouTube Editor, a simple to use but hidden video creator available through your YOutube account has instant access to a searchable list of CC licensed videos that you can use and edit straight in the program. Also recently added is a audio library of music that is CC licensed for use and downloadable so you can use off line as well. 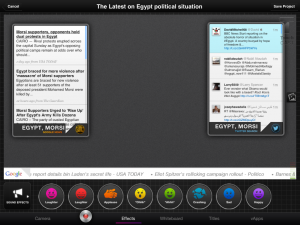 Below are screenshots showing where these tools can be found and what they look like. 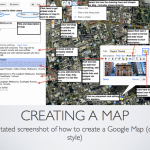 I’m attending my local Melbourne TeachMeet tomorrow with a focus on Google Apps in Education. 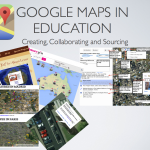 I have put together a quick Keynote presentation regarding Google Maps in Education that I am going to share. 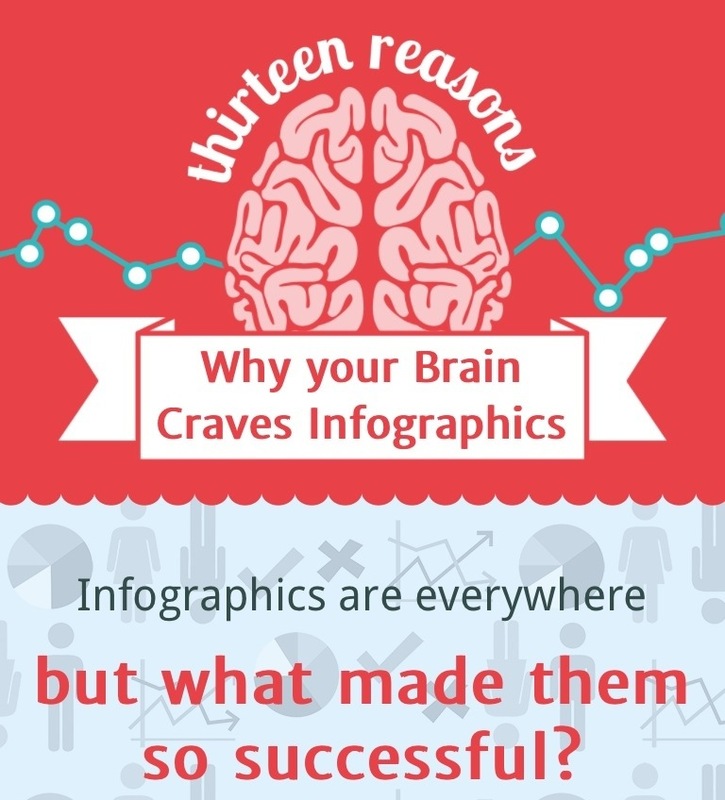 Below is the presentation for you to view in PDF format. For a fully interactive version of this video, go to the Touchcast website and see it in action. Just when I thought the Explain Everything iPad app was going to be my ‘go to’ app for everything in Education, this new app comes along. 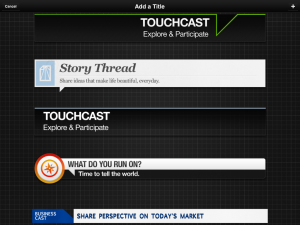 Touchcast (App Store link) is described as ‘the Web in a video’ rather than video on the web. It creates fully browsable, interactive videos that embed everything from websites, Twitter feeds and Youtube videos to polls, quizzes and news tickers inside your video creation.I’ve only just started experimenting with the app and am yet to create a completed video, but I’ve already started getting a feel for how it works. 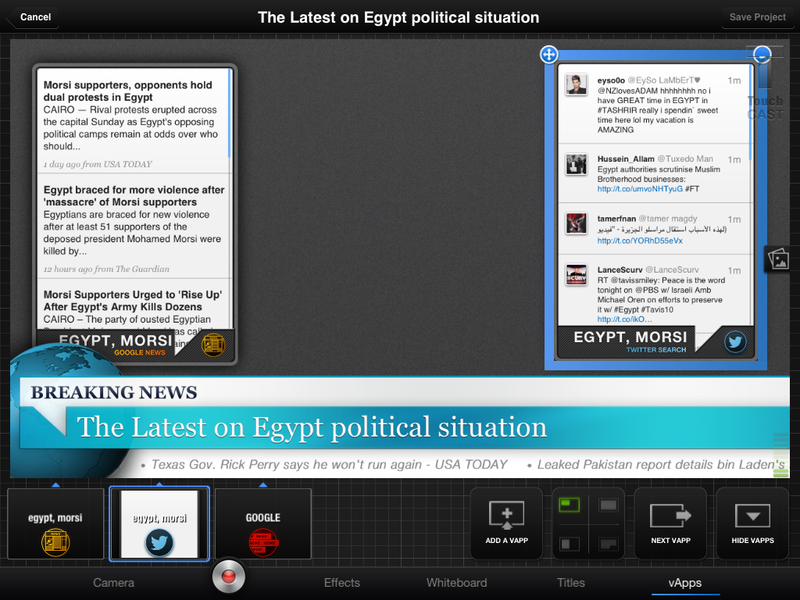 Like all iPad apps, its dead easy to use. Using it effectively and with purpose is the crucial step. While the above video and product website gives you a fair intro to the use of Touchcast, I’ve taken some screenshots of the app to show some of the features available. I have tested most but not all (greenscreen for one – sounds like a winner if it works well!). 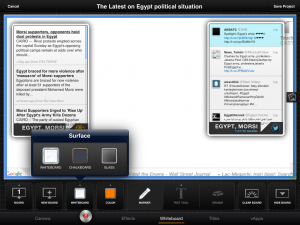 When you open the app, a number of themed touchcasts ( News, Business, Sports, How to, Review, Travel Diary) are available as well as the option to create one from scratch. 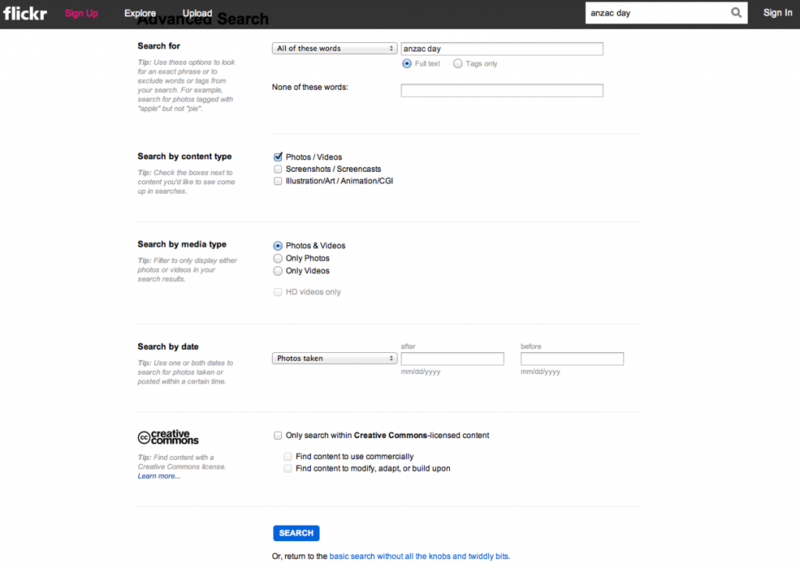 If you select a theme, the option to add the title and search terms is provided. This creates the Touchcast title automatically and adds relevant content related to the subject to be used straight away, as seen below with the inclusion of a news ticker from Google News, a Twitter Feed and News Headlines. You can delete these if you don’t want them. Deleting content is as simple as selecting and dragging the thumbnail at the bottom to a ‘magically appearing’ trash icon. One of the most powerful features of the app is the capacity to add vApps. These are the interactive, live and embeddable extra content elements that can be added to your video as you record. Ideally though, you would add and prepare all of these elements before recording. The screenshot below shows all of the vApp options. 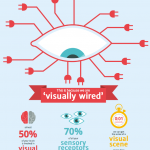 It’s an impressive list of options that can help create a truly interactive and educational experience in the school setting. 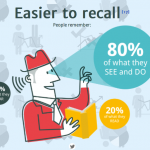 Imagine an interactive presentation that calls up web pages, images, polls,quizzes and rating systems, slide shows from Flickr, working GoogleMaps. There is certainly potential for overkill from both teachers and students but the possibilities for screencasting/flipped lessons, multimodal presentations, digital story tellings, project presentations, reports, reviews, surveys are there to be considered. Once a vApp is created, they appear in a thumbnail view at the bottom of the screen and with a simple touch they can appear and disappear from your video at your discretion. As I said earlier, by preparing all of the vApps you require before recording, you have great control over their use during the video creation process. Opportunities for digital literacy and multimodal learning abound in using this app but there are some limitations that are not obvious until you start using the app. First there is a 5 minute limit to the length of the video. Probably not a bad thing as you could fall in the trap of going overboard. Also this 5 minute limit doesn’t restrict you from pausing the video and viewing the interactive elements and multimedia content ( e.g. the embedded YouTube clip can be as long as it is in its source location). Another limitation is that the only additional video you can add is through the web. You cannot add your own video (only photos) from the iPad. This is probably reasonable, considering the file sizes this would create. 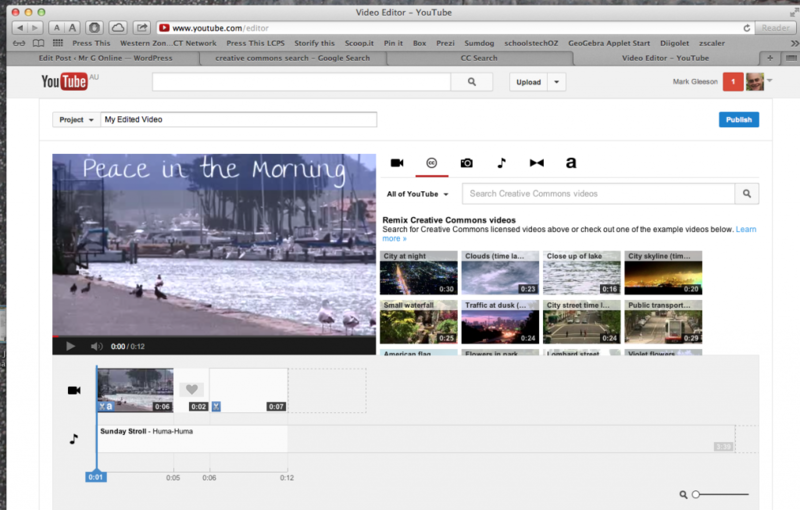 You can always add your video content to a Youtube account and then add it. As this is a very recent startup, at present it is a free account for users to experiment with. 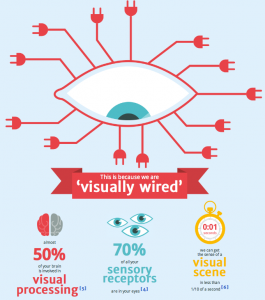 At present, this means a maximum of 60 minutes of video on their site. There are plans for paid accounts in the future but as it stands now, 1 hour is it. 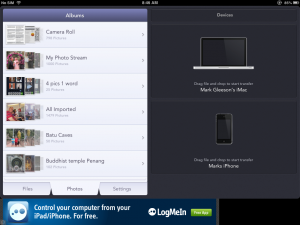 Of course, you can store videos locally on your iPad within the app, but you can’t save to Camera Roll. 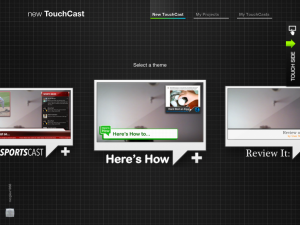 You can export to a Touchcast account on their website, share via social media and post on YouTube. Be warned, though, the YouTube video is only a video – there is no interaction. 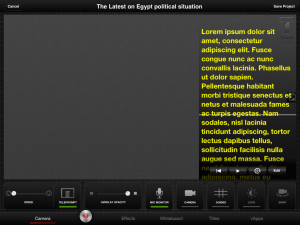 That is only possible through Touchcast. However, for presentation only purposes with all the content included, YouTube export is a way of storing more content if you dont need the interaction. As with most Web tools, the Under 13 caveat applies. There are some features you woud want to monitor.I have emailed Touchcast for clarification on whether it is OK to set up a teacher controlled account for students to post content from their iPad app. I’ll post their answer if and when they reply. 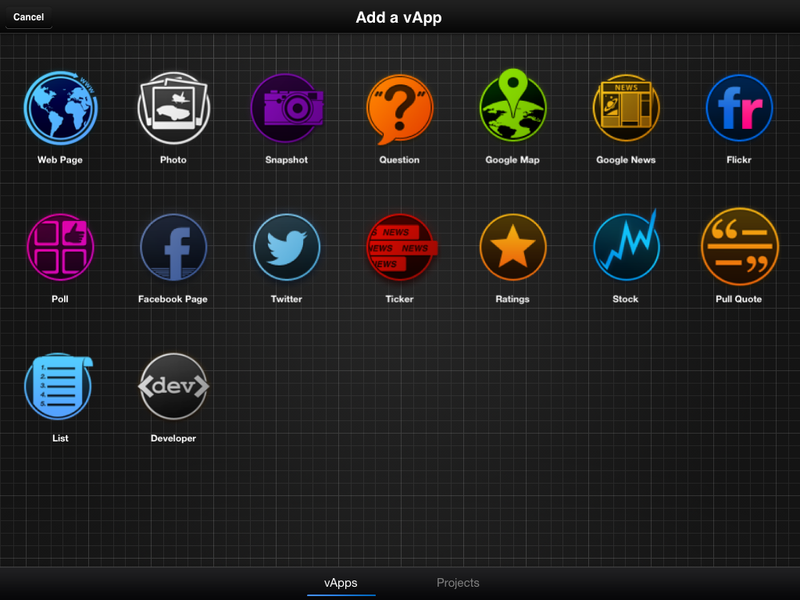 While it’s early days in my experimenting , I’m really excited about this app. 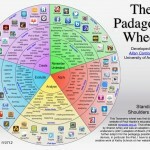 The use of it can really encourage creativity, problem solving, planning, and a range of digital literacy skills. Like any tool, we need to make sure purpose comes before play. 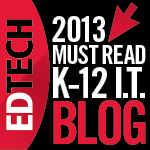 There is more to ed tech than engagement. We want it to make a difference. Check it out. It’s a free app but you do need to set up an account (not a lot of info required – user name and password). 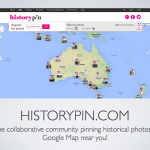 Would like to hear from anyone who has used it and appreciate ideas on how it can be used for educational purposes. Like most tools on the Web, they don’t start out aimed at schools, but we tend to find a way to embed them in teaching and learning. Everyone has their favourite inspirational speaker. Every teacher out there has probably seen Sir Ken Robinson’s TED talks and every school leadership team has a playlist of YouTube videos of their latest guru. This morning I just happened to discover this guy through a Scoop-it page I follow – Kevin Honeycutt. I didn’t know much about him but I do now that I’ve watched this video. His comedic style will keep you listening through this presentation but don’t be fooled by his boyish behaviour. He has a serious message to get out there. He draws you in with his personal story which is an inspiration to every child who has struggled and every teacher who has struggled to deal with them. Then he hits you with cutting observations about the state of education and how we can better it. And don’t think it’s all about tech – the teachers that saved him didn’t use tech; they cared. Of course in amongst all the anecdotes is some sage advice on how we can use tech to improve the learning along with changing the environment and, above all, the relationships. Take the time to watch this – it deserves more than the 654 views it has at time of writing. (Video and sound quality isn’t perfect but bear with it). If you want a quicker introduction to Honeycutt than this 45 minute video, try the one below. Similar message in less time but not as inspirational. I post the outline of Tasks to be attempted during the lesson. 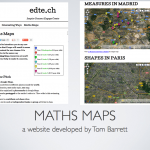 I add the initial image resources and models/examples that are needed for the task. Students scan the Padlet-created QR Code to quickly open up the Padlet on their iPads. The students start working on the task as outlined by the instructions on the Padlet and begin recording their responses. With the online Padlet wall visible to everyone on the iWB, students can start responding to what others are recording and as a teacher I can monitor from anywhere in the room or on my iPad and identify students to support or extend. I pause during and after each task and invite students to share their responses. As they are already recorded on the shared Padlet, no time is wasted waiting for them to rewrite their work. As a class we can utilise all the time on collaborating, sharing, discussing and questioning. If tasks involve using physical or digital resources, the students can quickly post screenshots, photos or images straight onto the Padlet wall on their iPads or laptops. Using a range of familiar iPad apps, children can record and/or annotate their working out and post it straight to the wall. At ant time during the lesson, with constant access to all of the work being done by the students through the visible workspace on the iWB, I can reconnect with the students and offer feedback, teaching support or ask questions to call on children to explain their learning. When the students leave me, I can immediately post the Padlet wall with all of the students’ learning documented onto their class blogs for their teachers and parents to view. This particular lesson, embedded below, began with students viewing four rectangular prisms of varying dimensions. The students were asked to order the objects from largest to smallest and justify their decisions. In a traditional classroom setting, a teacher may call on 3-4 students to share their opinions and move on without having a true indication of the other students’ understanding. 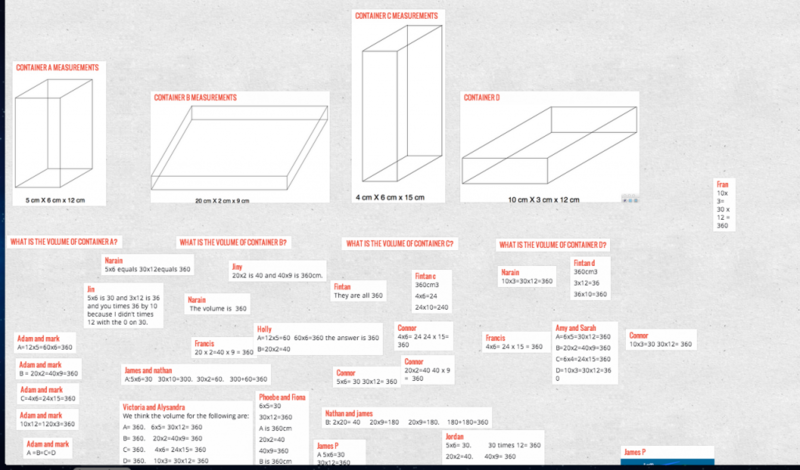 In using Padlet, I have an easily accessible, permanent record of all of the students’ understanding of volume concepts. The next task was to verify their conjectures by calculating the volumes of each prism. This particular group of students were high achievers and needed little assistance in calculating the volumes ( the LxWxH formula was not the focus of the lesson, anyway but with a second group of students, I needed to do some revision and monitor progress). 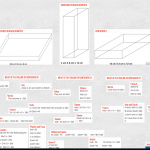 They were asked to record their working out directly to Padlet, with the option of recording the detailed calculations on Explain Everything and posting screenshots of the work. This group were able to simply write their calculations directly into Padlet. This provided a record of their work for their teachers to see later and was also a way for me to view their capabilities on screen in case I needed to assist. This was not needed with this group, but with the second group I was able to identify students with gaps in their learning simply by viewing their work on the Padlet wall. ( At no stage did any student notice what others were doing – they were engaged in their own work.) What was also good to see was the variety of ways students calculated the volumes in terms of selecting which numbers to multiply first. This initiated a discussion about factors and the commutative/associative laws for multiplication. With all possible combinations visible rather than the 3-4 examples that would have been shared in a traditional setting, we were able to enhance the understanding of the range of dimensions that can result in the same volume. This also allowed them to refer back to their initial misconceptions of volume ( taller is bigger, etc) and led to a quicker transition into the final task. Now that they had come to the realisation that there are many ways to construct a box of the same volume, we moved onto the final task which was constructing prisms of varying dimensions that would make a volume of 72 cubic units. 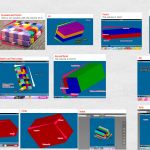 At this point, they were introduced to an already completed example of the final product I was expecting of them ( which was already embedded on the Padlet wall, but out of view until needed) and the iPad apps available for the task – Think 3D and Skitch. They were also given the option of using physical blocks if they preferred a more tactile method. The simplicity of the apps required little instruction and the students were quick to start experimenting, further developing their understanding of the Volume formula by constructing rather than just calculating. The idea of factors were utlilised as they constructed layers based on the factors of 72. Again, with the use of the Padlet wall, students were able to post their annotated ( using Skitch) constructions directly on to the wall, providing a record of their work that can be accessed in the future. Seeing other students’ constructions on the wall enabled students to consider other possibilities and further built on their understanding of different dimensions, same volume, which they were then able to reflect on later when the wall was embedded on their class blog. Having the lesson documented on line means that students also have the opportunity to add to the wall later on at home and explain their work to their parents. 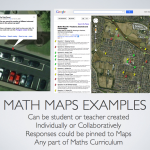 I see many benefits in this process of documenting the learning and not just in Mathematics. In this new era of collaborative teaching, it’s a great way of recording a lesson for other members of the team to view. As a Maths leader/mentor, it’s a useful way of modelling a lesson for teams to discuss. For assessment purposes, it can provide a record of the different stages of learning that took place during a lesson or series of lessons. This week, I was involved in a school based ICT Conference at my own school, during which several teachers led workshops on various ICT tools and practices. 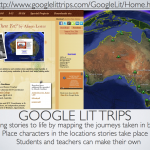 I presented this lesson structure and use of Padlet to the staff and they saw great possibilities. 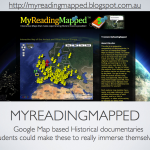 I am going to continue to develop a range of learning experiences using this documenting method. I see it having great benefits in enhancing the learning at our school. Over the last few years, I’ve been looking for ways to make interactive whiteboards actually interactive. Despite the hype around them, iWBs still promote stand at the front content delivery and the interactivity is limited to the two students/teachers holding the pens. Everyone else is still pretty much a passive observer with regular doses of disengagement. With the recent creation of iPad mirroring software like AirServer and Reflector, the whiteboard has become more interactive with the ability to project multiple iPad screens onto the board. This is still a limited solution as only so many iPads can fir on one screen. In recent times, though there has been a proliferation of Web 2.0 collaborative tools that have the potential for full class interaction. My favourite at the moment is Padlet. 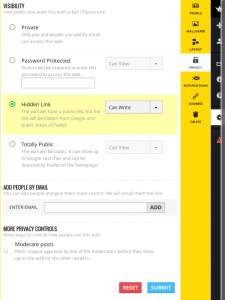 Formerly known as WallWisher, Padlet started out as an online pinboard where unlimited users could post notes on topics being discussed en masse. It allowed for everyone to have a voice in a discussion and provided teachers opportunities to save and store brainstorming and discussion sessions online for later review. As WallWisher, though, that’s where its functionality ended. It was pretty much an unlimited post-it note space ( correct me if I’m wrong – it may have allowed for some media posting. I can’t remember). Now, with a major upgrade and name change, Padlet has morphed into a full blown online interactive whiteboard, collaboration, presentation, lesson management system with massive possibilities for teaching and learning. 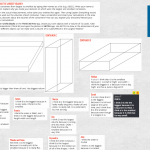 Before demonstrating how I have used Padlet in the classroom in ways I couldn’t have in the past, I’ll give you a quick(ish) tutorial in how it works. Padlet has a wide array of sharing tools to make your wall accessible. 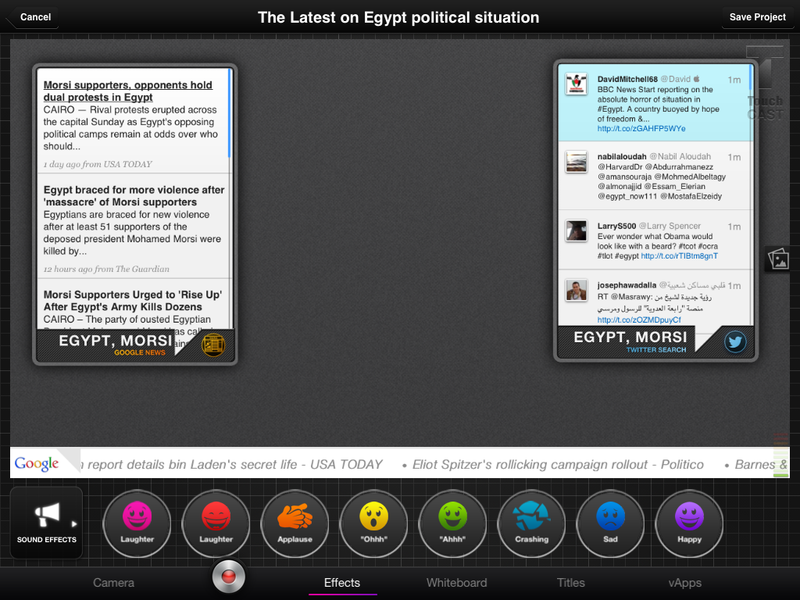 Check out the screenshot (left) for more detail. You can embed it into a blog, where it is fully active within, email a link or subscribe to it, post it to a number of popular social network sites and my favourite – create a QR code for instant access with a QR Code Reader app. In all my lessons using it this year, I have saved a lot of login time having the QR code in the room for students to scan and go straight to the wall on the school iPads. They are now around their classrooms so they can return any time. It is best used on a computer for full access to all features but, other than attaching files, works very well on iPads and, I assume, other tablets. 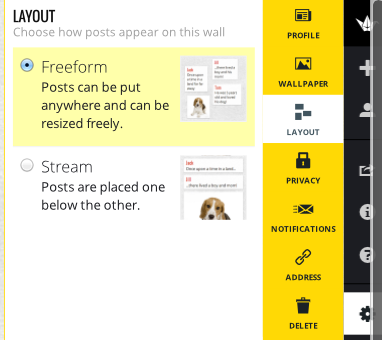 In creating a wall, you have options to add a background, a title and title image, modify privacy setting. choose between two layout options, create a custom website address and choose notification options. 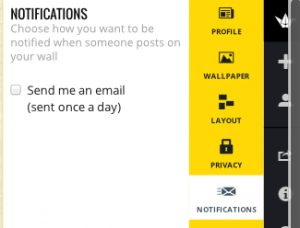 This can all be done within minutes before sharing the wall for others to interact with. 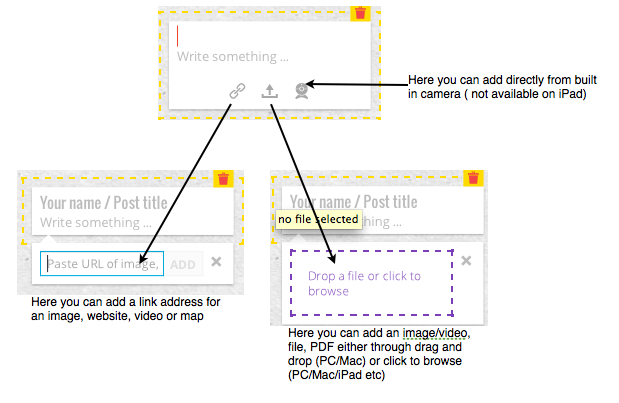 Padlet is extremely easy to use. Just simply double tap the screen and the multimedia note appears. The screenshot below shows how it works. That’s pretty much it. The true value is in what we do with the app. Below are two walls I have created in the last fortnight. 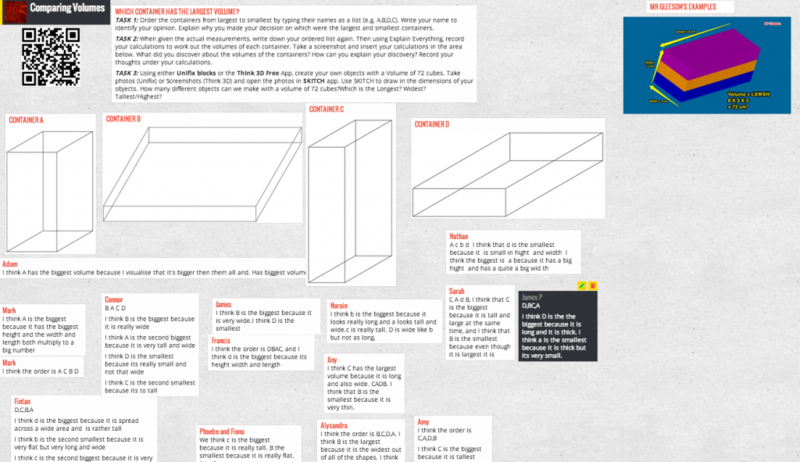 The first is a Maths lesson involving surface area, volume and algebraic thinking with my Extension group. I created the 3D ‘sculptures’ using the Think 3D Free iPad app, took screenshots and imported the shapes straight into the wall. Titles and information was added easily. I then added the problem to solve and added a screenshot of a table to support the problem solving phase of the lesson. To begin the lesson, the students scanned the QR Code with iPads to go straight to the page. Having direct access to the problem through Padlet rather than looking at a screen from a distance had the students engaged from the start. They were able to get straight down to working at their own pace in tackling the problem. 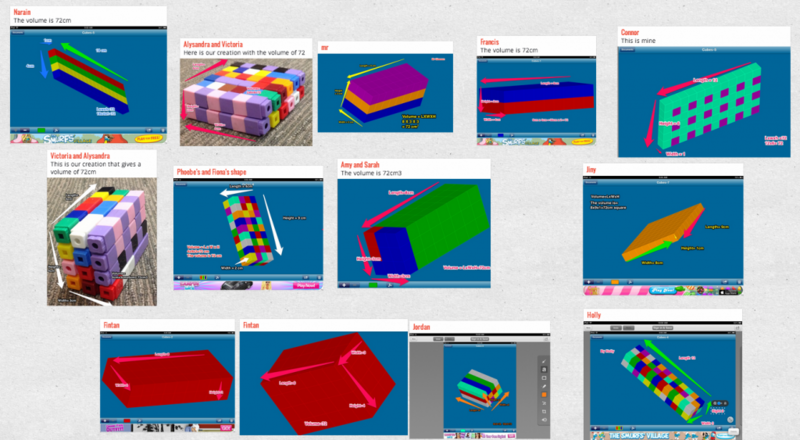 The benefit of Padlet was soon apparent as each pair of students were given one sculpture to find the volume and surface area of. As soon as they had the answer, they were able to add their results to the Padlet wall for the rest of the students to access. This is in contrast to having to wait for everyone to finish and add to the board in a traditional sense. Let me note here that the measurement aspect was not the main focus of the lesson so quick calculation and sharing was important. Once all the measurements were shared on the Padlet wall, the students were ready to create their tables to start looking for patterns in the pricing. The rest of the lesson wasn’t dependent on Padlet from this point but its next benefit was in collecting the students’ work to feed back to their classroom teachers. Having all of their working out, answers, collaborations, tables ( not all on there at the moment – still a work in progress) collated in Padlet means the teachers have access to what they did with me. On top of that, the students were able to embed their work on to their personal blogs for their parents to see what they were doing. 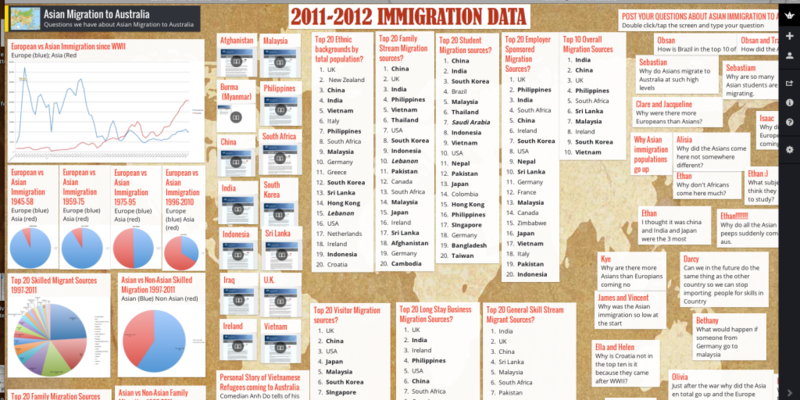 The second example below was used for an Inquiry workshop focusing on Asian Immigration to Australia. Over five sessions, all of the Grade 6 students worked with me using this wall. I wanted them to have access to a range of data that I hoped would generate questions and discussions. 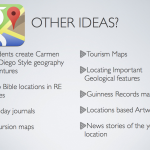 As I was not going to have a consistent role in the rest of their Immigration investigations, I wanted to use a tool that could collect all of their wonderings that their classroom teachers could access during the ensuing weeks to develop further. Padlet supported this greatly. I was able to take screenshots of graphs I made in Excel and add them to the wall. 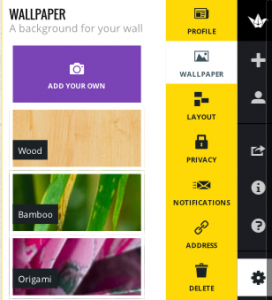 A great feature of Padlet is that you can resize your content to fit in a small area for an overall view but by simply tapping the image, it enlarges to full size for easy view. This allowed the students to see the graphs in detail in their own time if they wanted to go back to make their own observations. This is in contrast to having a single view on a whiteboard that can become inaccessible to children working at their own pace. As you can see from the wall, the students were able to add all of their observations and questions directly on the wall. 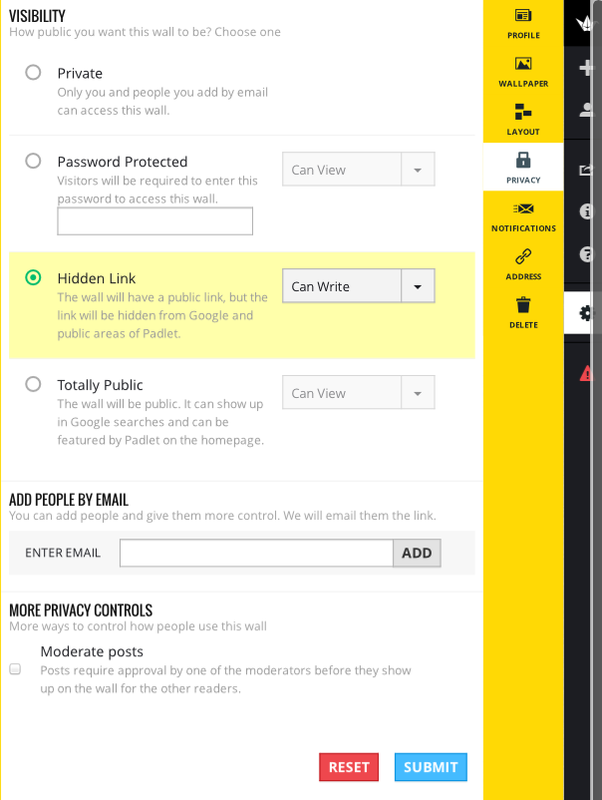 Note that as the wall filled, dragging a comment to the edge of the wall created more space for as many comments as they could add. This is a stark improvement on the limited access they get when they have to share real post it notes or a limited sized sheet of paper or take turns to add their thoughts. 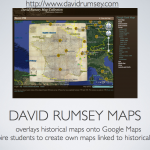 Using Padlet allows the students to be fully involved in the thinking process at all times. The follow up to this is that common questions can be grouped together on the Padlet wall adding to the collaborative process. What I have also achieved in building this wall is pooling together a large number of resources in one easily accessible online space. 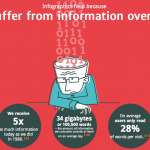 The graphs, the videos, the PDF documents are all stored in a common place and can be viewed at full size at any time. The QR codes are sitting on the classroom walls, allowing the students to access this information at any time. In using Padlet in both of these lessons, I loved that the students had personal access to info at all times, were able to contribute to the wall at their own pace and could view what others were contributing in real time. At the teacher level, I loved being able to collate all of the resources in one space, resources that can be enlarged for useful viewing when needed. I love that in a collaborative teaching environment, I can collect student group work to share with their classroom teachers. I love that I can now have a truly interactive whiteboard that keeps all students involved in the learning process. These are two examples but Padlet offers many opportunities for engaging teaching and learning across all curriculum areas. 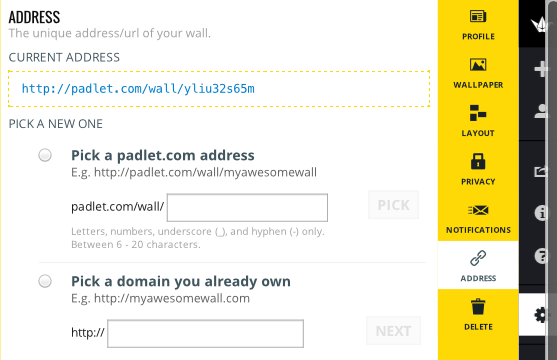 If you have used Padlet, I would love to hear about what you have used it for. If you haven’t tried it before, give it a try. Easy to use, many possibilities. After viewing my post on the benefits of FileBrowser, one of my Twitter colleagues alerted me to an app I had not heard of with similar functionality – Instashare. After downloading and checking it out, I thought I would do a quick tutorial and review on Mr G Online as I think, with future planned updates, this app will become a useful addition to the educational setting of iPads I blog about most frequently. In a nutshell, Instashare is both an iOS app and Mac application that uses a very simple drag and drop interface to transfer photos, videos and supported files from one iOS device to another with absolutely no set up required other than downloading the app onto your device. Here is the Product Description straight from the App Store. You don’t need to be tech-savvy to share files. You don’t need to be connected to internet, just use local wi-fi or Bluetooth to transfer file. No need to pair devices or setup transfer. 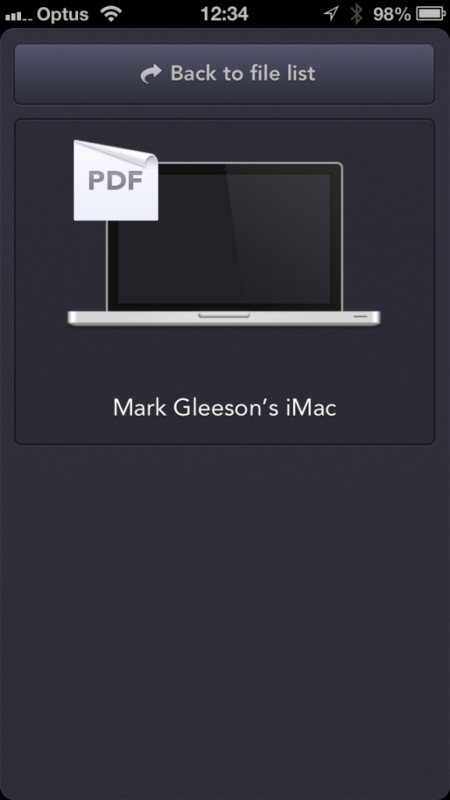 Designed for quick and easy file sharing. 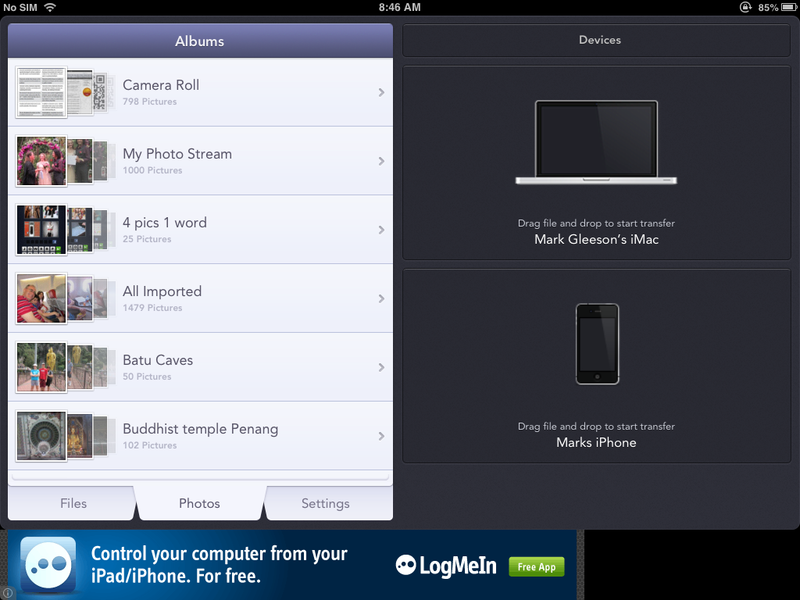 Just open app and start sharing files, no need to enter email or passwords. You can transfer any file type, no restrictions. 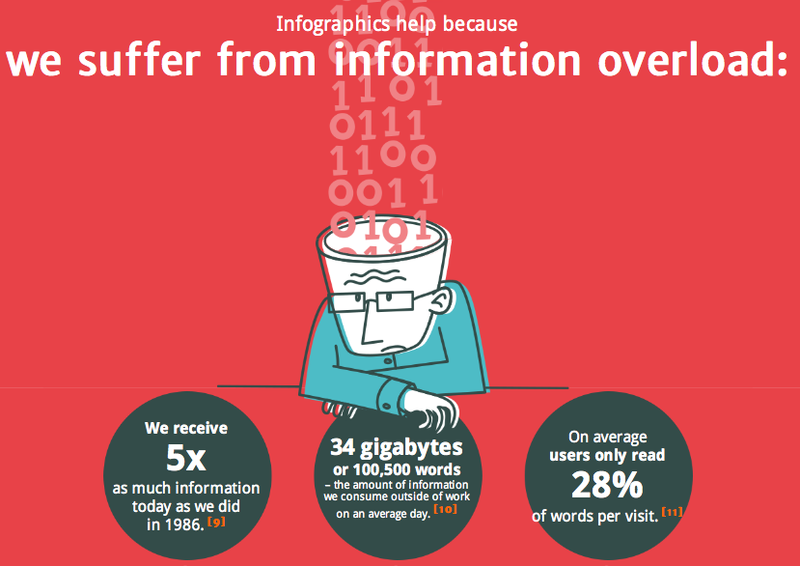 MP3, images, pdf, presentation and way more. I’ll describe here what is happening in the video. Basically, you open the app on your iOS device ( in this case, the iPad) and any device that has the app open ( the app does need to be open – it doesn’t work in the background), will appear on the screen. You then simply select the file to transfer, drag it to the desired device and it will transfer over to that device, be it Mac computer, iPhone, iPod Touch or iPad ( from reading Twitter updates, an Android version may have just been released). What you will notice on the video is that the first transfer I attempted failed. This was because the app on the other device, the first time you use it, brings up a dialog box to accept the file. If this is not allowed, the transfer will not take place. You have the option of Allow or ALWAYS Allow. On my own devices, I chose ALWAYS Allow so I don’t have to continue to accept the transfer manually, particularly if I am not next to the computer I want to transfer to. Now, when I drag and drop to the my devices, it happens automatically. 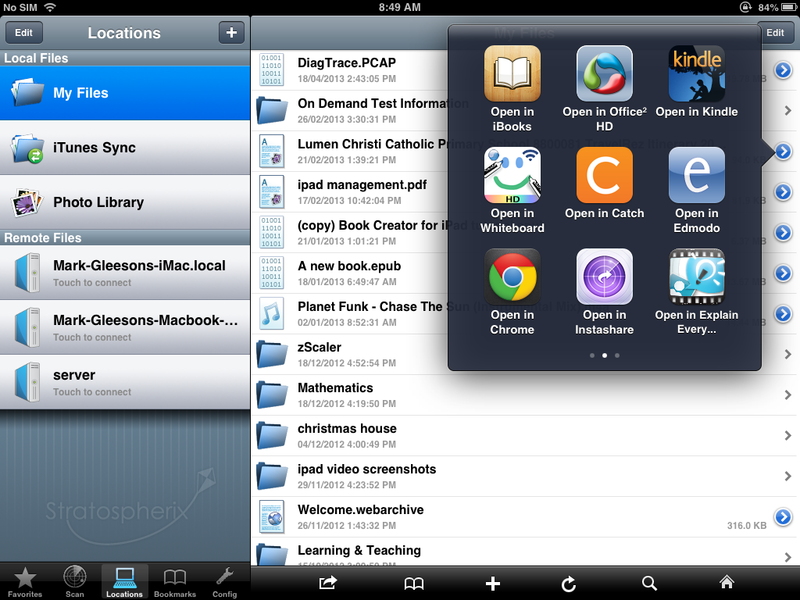 On the iPad, there is enough screen space to drag over to the device. On the iPhone, when you drag the file, the screen switches automatically to the target device. The drag and drop interface is definitely an improvement on the FileBrowser interface and the direct transfer between iOS devices will come in handy when a student wants to submit a file to the teacher if they both have iPads. From other apps, Instashare is one of the choices in the OPen in Another App… option so you can quickly transfer a Pages document, a file from the DropBox or Google Drive app as an example. Also, it is free, unlike FileBrowser. Instashare, however, still has some major flaws that will keep me using FileBrowser. Having said that, the developer has informed me that some of these deficiencies have been addressed in an update awaiting review in the App Store. At present, you can only drag and drop one file at a time. This is fine if an individual student wants to send a single file to a teacher, but if you want to transfer 30 photos over to your computer, one at a time is not functional. This is apparently addressed in the next update, although I don’t know if there is a limit. FileBrowser has not limit. 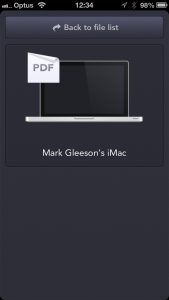 As of publishing this post, the required app needed to be installed on the computer side is Mac only. ( and it won’t work unless you download and install that Mac application, which has to stay open.) There are plans for other systems but at present, with the fast majority of schools being PC, this precludes its use beyond iOS device to iOS device transfer. FileBrowser, on the other hand, can connect to any networked computer and you do not have to install any related software for it to work. On the computer side, you have to designate a target folder that all transfers download to. You then have to manually transfer to other folders on the computer. 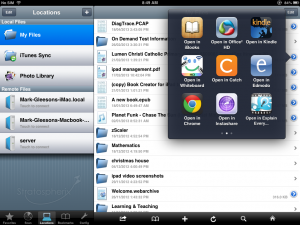 FileBrowser allows you to browse to any folder and also allows you to create new folders direct from the app, meaning you do not have to have any access to the computer at all. You can also rename the file. It’s only a one way transfer service – from one device to the other. Yes, you can transfer from Mac to iPad by the simple drag and drop but you have to have access to the computer. With FileBrowser, you have control over both sides directly from the app, again not requiring physical access to the computer. Despite these criticisms, I really like the app. If the next update brings in multi-file transfer, I’ll find myself using it a lot because of the drag and drop interface and the direct iOS to iOS option. The Bluetooth transfer can bypass issues on days when the school WiFi is in meltdown as well. Until it allows PC access and the ability to browse folders, though, I’ll be sticking with my very reliable and useful FileBrowser app. But with improvements to come in future updates, Instashare will become a serious rival to FileBrowser and other network apps.